Up to 2001, serial default characterized Turkey's economy. 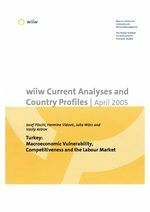 The wiiw study analyses the reform steps undertaken in recent years, raising the question whether the economy's vulnerability may have diminished. At least for the time being, so the result, the proneness to crisis is low. The long-run development however will depend on the central bank's policies with regard to inflation and the exchange rate and on the existence of reform-oriented strong governments. The latter condition will not be easily achievable as painful reforms have a high potential to lead to an erosion of popularity. Another aspect addressed in the study are the changes in the structure of the Turkish economy. The wiiw study focuses on a very important Copenhagen criterion, the enterprises' ability to withstand international competition, which manifests itself in foreign trade and current account results. The relevance of this aspect increased with the start of the customs union between the EU and Turkey in 1996. It will increase further with the projected inclusion of agricultural products as well as services. With regard to indicators of competitiveness, the wiiw study compares Turkey to old and new EU member states and candidate states alike. It shows that Turkey's economy is opening up and that the structure of exports is changing rapidly. Turkey holds a strategic geographical position with regard to transport of mineral fuels, a topic briefly addressed in the study. It is the labour market where Turkey differs strongly from what is standard both in EU-15 countries and in the central European new member states. One chapter of the study is dedicated to this very important topic. The overall picture drawn by the study is an economy rich in contrasts in many respects: between urban and rural, rich and poor, official and black, technologically advanced and archaic. Apart from the conditions prevailing in the labour market, the development trends of Turkey's economy do not differ substantially from what can be observed in the new EU member states and the candidate countries.